I designed these logos for a husband and wife realtor team. They are very laid back and fun people, so these logos really fit their personalities. They came to me with the Jib Jab/retro idea and we ran with it. I think it's colorful, stylish and will stand out over the competitors stuffy realtor logos. They wanted two versions so that they can mix it up and use them for different applications, but the logos are still coordinated keeping their brand identity consistent. We filled 3 cars with about 1,913 boxes of cookies! Anna loves to be silly and LOVES to quote lines from movies. It's amazing the things they pick out and remember. I think Brian snapped this photo of her wearing the broken lens piece of binoculars. Fun thing... they like the broken piece better that the toy as a whole. 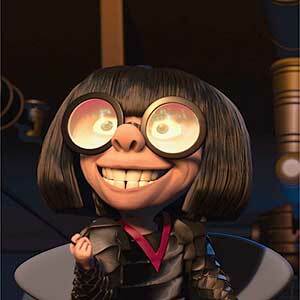 This photo of Anna reminded me of Edna from The Incredibles. Her latest movie quote, told at dinner tonight. Anna: hey Pops remember Mrs. Potato head says "here's is a crayon if your bored. Amelia: no she said pencil. Anna: no she said crayon. I guess we need to watch Toy Story 3 again to find out. By the way, we do not watch that much TV... really! The girls only get one movie a week at our family Friday movie night and one 1/2 hour show a day after school. And because they don't watch a lot they really love Friday movie night, I think it's their favorite night of the week! My two monkeys came sneaking into our bedroom Sunday morning and yelled... "Happy Presidents day" with the same tone and excitement you would say Happy Birthday or Merry Christmas. I had to burst their bubble and tell them that it wasn't until tomorrow. So this morning I got the same morning greeting... "Happy Presidents Day!" I'm not sure what they thought today would bring, I think Amelia was excited because she has a play date set at her friends house today. It was nice to sleep in a little bit. Don't you just love this light box table! We saw it a the contemporary museum of art, I love it and already have plans to build one for the living room! Brian did get a nail gun for Christmas and I know he wants a project to work on.... maybe? He also thought the table was cool, so I'm adding it to our "to do" list. Remember those days long ago.... making your valentine shoe box anticipating all the cards you will get! Now it's my girls turn... what's more cute than a first grader and her valentines? It all just makes me smile! I hope you got a special valentine! Here is a short, stop motion video Amelia and I made yesterday. Send it to someone you love! The girls and I made these cute cards for them to handout at their classroom party. I first saw this idea online last year, I can't remember where I saw it, but I loved the idea! You still have a few more days... go ahead make some for your sweeties! I found this great recipe here at "an art nest". I wasn't sure how it would really taste, but they were really good and easy to make. Just make sure the oil is not too hot or you will burn the first two... like I did. 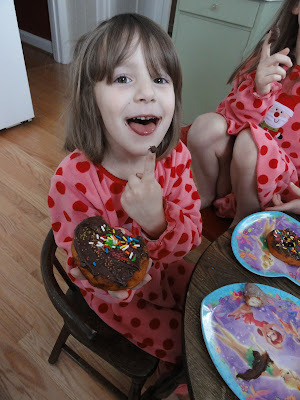 We made glazed donuts and some chocolate icing donuts (cake icing from a can). Then loaded them with sprinkles...the girls loved it! We might have well just eaten cake for breakfast, oh well, you gotta have some fun right! Now open the biscuits and layout on wax paper. Cut out centers with a small round cookie cutter - or anything else you can find. Keep the middles to make donut holes! In a small bowl mix confection sugar, water, and vanilla. Set aside. When oil is hot (I stick the end of a wooden spoon in the pan and if bubbles appear around the spoon, its ready)carefully drop in 2 - 3 donuts at a time. Stand right by the donuts as they will cook quickly, when one side is golden brown, flip to the other side. Tongs are really useful for this. Take out cooked donuts and place on a paper towel. Finally, drizzle the donuts with your glaze and sprinkle with some extra confectioners sugar. My co-worker Troy and I have been working on this new website for the Missouri Department of Health since October. We finally launched it last week. We are all very happy with how it turned out, it's very informative and a bit edgy. AMELIA: "There is no"... she asked me the next word.... " for hamsters" ? AMELIA: What does it say? ME: (thinking to myself, quick... how do I put this) It's a disease that big people get if they don't take care of themselves. AMELIA: Oh. (and off she went to play). Whew... now that she is starting to read everything in sight... a new level to this crazy world has been opened up to her. Want to learn about STD's? Visit the new site here. I bet you learn something new. I sure did while working on the site. Meet Evalyn my new niece. Isn't she just a doll! My brother and his wife live out of town, about 15 hours away. 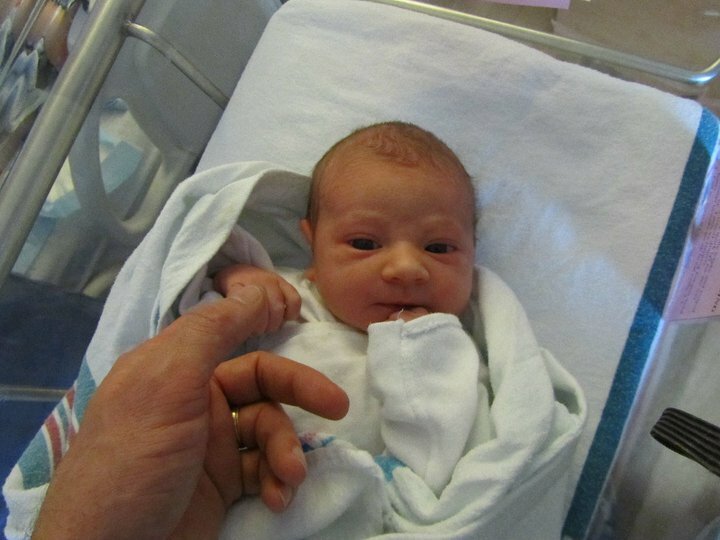 I'm so bummed out that I can't go visit and hold her right now. It might be two months or so before I meet her in person. I will get to see her on skype, but it's just not the same. Hold tight little Evalyn, your auntie is on her way! This is what you get when Anna picks out her own clothes, total miss match. I usually steer her to a matching outfit but it was a Saturday and I just sent her up to get dressed. We went to church that night and I did not make her change. 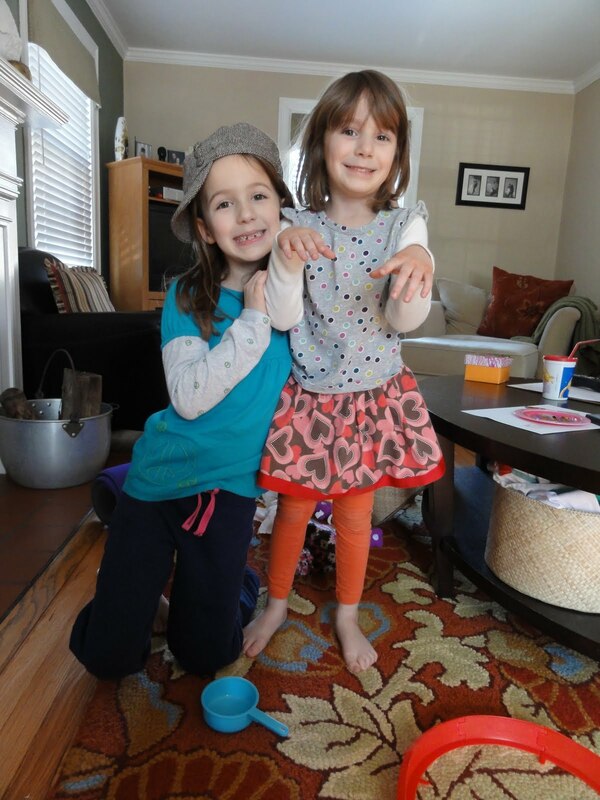 She added her rainbow, halloween cat socks and pink shoes to the ensemble before we left. There is a only a short time in your life when you can dress all crazy and it is actually kind of "cute". She might as well enjoy it while she can. Note: She is standing like that because they were playing doggie, Anna was the puppy. 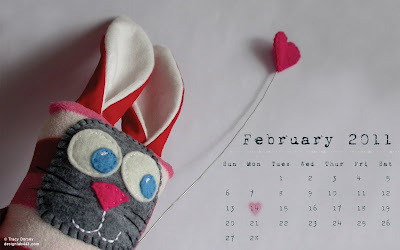 Here is a little calendar cuteness I created. I plan to make one each month, so check back for March's image. You can use this for your computer wallpaper, print one out for the office, your craft room or the fridge. Double click the image for the high res file. All images are Copyrighted by Tracy Dorsey, 2011. Free download for personal use only. Not for resale.